Lt. Gen. Paul Nakasone, the White House’s nominee to lead the National Security Agency and the U.S. Cyber Command, has said the U.S. military is prepared to launch cyber attacks on peer adversaries’ critical infrastructure through network intrusions during a future conflict, the Washington Free Beacon reported Tuesday. 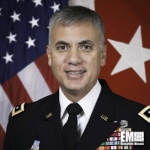 “We face a challenging and volatile threat environment, and cyber threats to our national security interests and critical infrastructure rank at the top of the list,” Nakasone, commander of the Army Cybercom said in response to written questions by the Senate Intelligence Committee in March. He responded to a question about the need to inform Russia, China and other near-peer adversaries about the U.S. military forces’ capacity to strike back in the event of attacks on U.S. critical infrastructure. “The ability to respond appropriately and effectively is an essential element of any deterrence strategy,” said Nakasone, a 2018 Wash100 recipient. “To be operationally effective in cyber space, U.S. forces must have the ability to conduct a range of preparatory activities which may include gaining clandestine access to operationally relevant cyber systems or networks,” he added. He also discussed the persistent engagement concept and the risks posed by cyber threats to safety and public health.